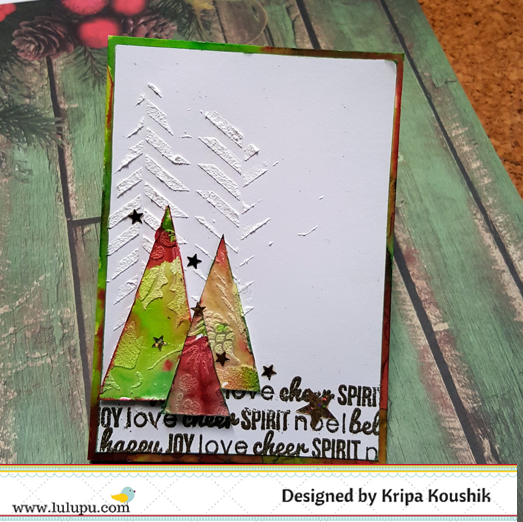 Neha here and today I am sharing with you some CAS cards which I made using stencils. CAS is usually not my style and I was bit worried, but to my surprise I loved doing it. I had fun creating these cards. But Before I go ahead I would like to remind you about our current challenge. Here is the link to it. Today is the last day to link your entries so get it done before it gets over. Now coming back to the post. 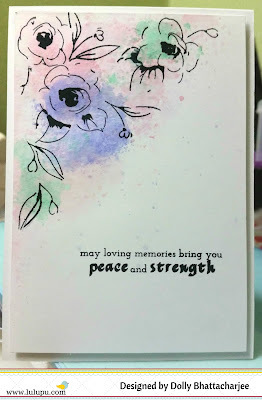 I have used various techniques with stencils to make these cards, like using Distress Inks,Ombre effect, embossing and Texture paste. So in total I made 4 CAS cards. So here comes the first one. 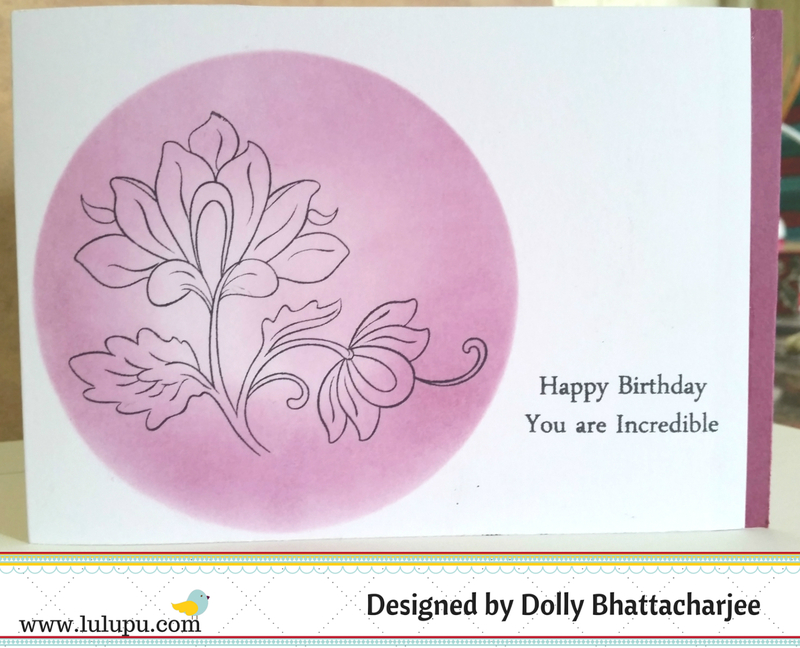 For this card I took a White CS and simply sponged DI picked raspberry through a stencil. I have varied the intensity of DI, at some place darker shade and light at others. Matted it over a Bright pink CS of matching shade which was then matted over a white card base. Finished off with a sentiment and a die cut butterfly. 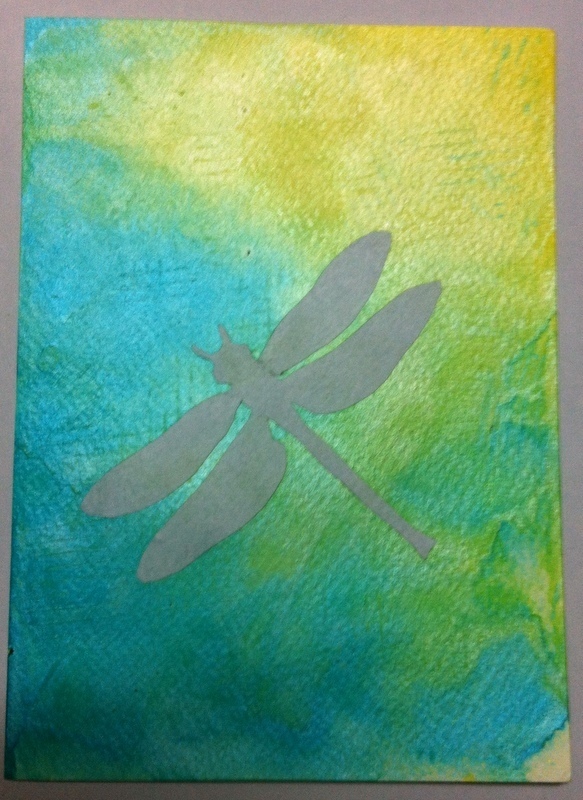 In second card I tried ombre effect with stencil. I started with dabbing DI spun sugar through the stencil over a white CS, then worn lipstick and finally Picked raspberry. Matted it over a white card base. Stamped a sentiment (Kaisercarft) on vellum and heat embossed it using black EP. Placed it in the center of the card using foam dots to add some dimension and finished it off with enamel dots on its four corners. 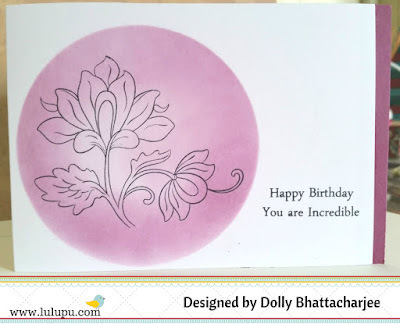 For the third card I decided to do heat embossing and its really very easy to do it with stencils. I just dabbed my mini versamark ink pad through it on a white card base, added Clear EP onto it and embossed it using heat gun. Thereafter I used DIs Picked raspberry and Spiced marmalade for the emboss resist effect. Added final touch with some twine and a die cut. And now comes the final card. Here I have simply used Ranger's texture paste through stencil on a white CS. Matted it over a white Card base. 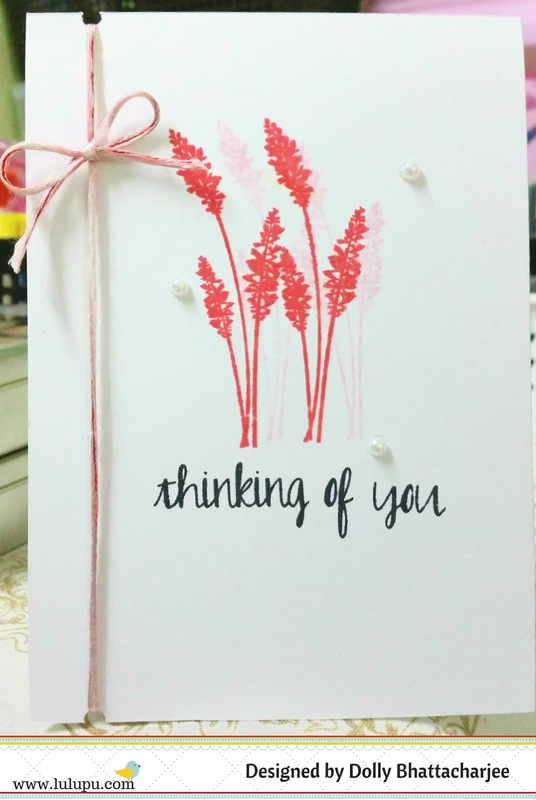 Added some color to the card using heat embossed vellum flowers, leaves and sentiment. The stamp set is from IO, heat embossed it using gold EP and then colored them with sketch pens. Added some rhinestones. So Guys this is all for the today's post. I hope you like my cards and will try some CAS cards using stencils in different ways. Lulupu store has a wide range of stencils available here. There is still some time left to link your entries for our current challenge here. This is Manu and we, the team lulupu is showcasing CAS cards for this forthnight!! The team has decided to bring in some interesting topics to share with all of you every 2nd fortnight of the month, the first fortnight will be all about the Inspirations for that months challenge. The Second fortnight will be dedicated to some fabulous tips, tricks and techniques about the various trending things in the crafting industry so that we are all well aware of what goes on around us. The team has done a fabulous job of showcasing different CAS style cards till now. We still have one more post about these CAS (Clean And Simple) cards apart from this one. 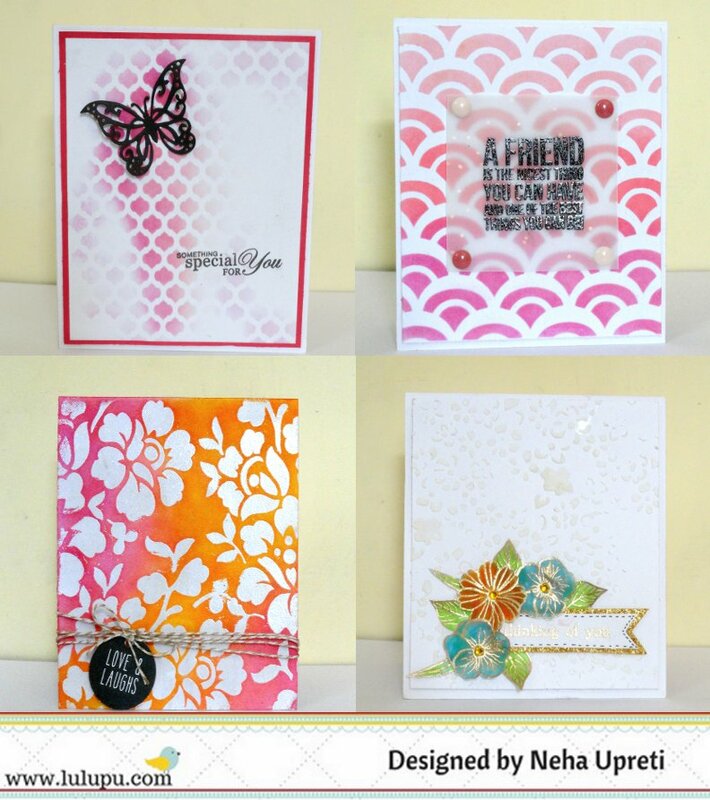 I have focused on the Stamped and sentiments based CAS cards and have quite a few to share with you today. Before I share what I made, I'm sure you must have made something for this months challenge and do not forget to share and link it up here. This month is all about Anything but a square and Rectangle, read all about it here. Here's what I made for the CAS cards. I made 5 different cards using different techniques and which gave different looks too! This Card is made from Avery Elle stamp and I soo love the cute baby elephant in this one!! Elephant themed stamps are so in trend these days, I couldn't help getting one for myself. The front panel is die cut with a circle die and then kept inverted to get the green and blue distressing done. Then it's flipped back for the stamping and the colouring. 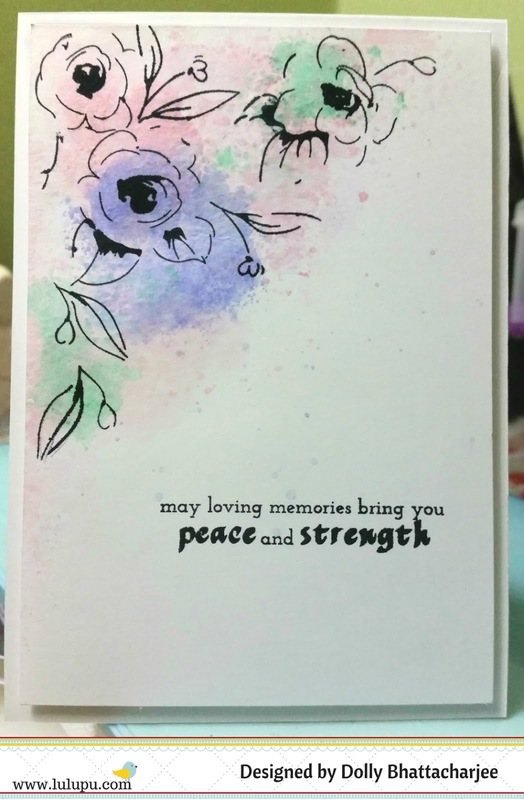 This is another simple one with Micia stamp flowers and W&W sentiment stamp. CAS is somewhat I thought is not my style until I made these simple cards. Simple, yet very unique and fun! Well, one of my fav brand for Cute stamps is the LAWN FAWN (checkout the store for some awesome Lawn FAwn stamps) and the cards comes out to be super cute when these stamps are used. I definitely had to make one using these pretties! 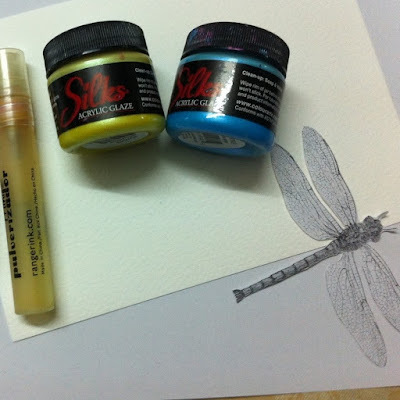 Watercoloring is another trend which is super hot in the crafty world these days!! We had a watercolor challenge too which was a big hit with our readers and Since BOLD and BIG sentiments world awesomely well with watercolors, I went ahead and did a very simple water resist embossing technique in this card, and I was happy the way the colors pop up against the black background. Well, I have always loved the night sky so making this sooper lovey dovey card was a must! I truly adore the way this pretty one came out to be! I hope you all liked the cards that I made for the CAS theme for this fortnight !! Do not forget to link your entries for our this months challenge here. I have a very interesting post for you all today. She has even prepared a tutorial to share with you all. Crafting is a small part of me; I am an Economics graduate, a writer (with five best-selling books, all more than ten editions each) and an Astro-Vastu consultant with a busy practice. Wife to a Management consultant and mother to two loving sons Devaansh aged 20 and Ritvic, 13 yrs. I am a voracious reader and we are surrounded by books in our house on all topics !! I started my blog on March 2013 on an impulse. I had been doing some quilling with handcut strips and trying out with glass colors on bottles before that. Mainly started following some blogs with an idea to help my son in his school projects but then got more and more involved. I am so happy to have joined this beautiful world and for the generous support and love from so many of my blogger buddies. All my learning has been from the generous sharing by bloggers around the world and I like to repay my bit by doing tutorials and WIP pictorials whenever I can. 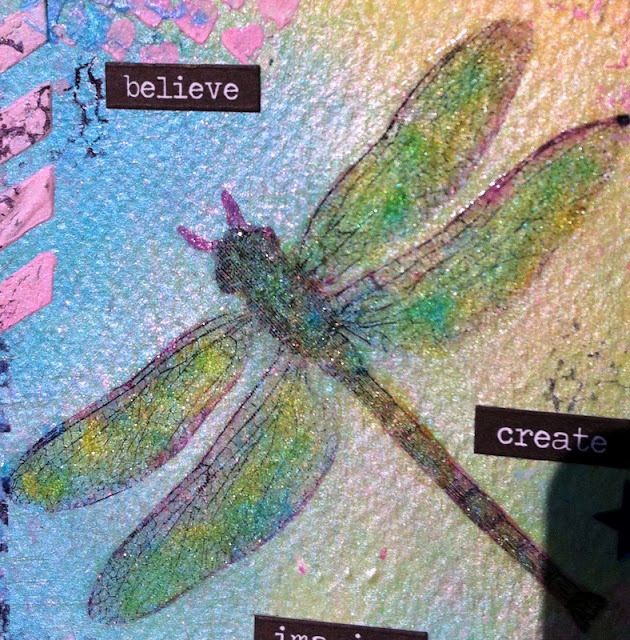 Hummm….maybe acrylic paints, stencils and Texture paste….and a paper knife!! Love mixed media for the freedom it provides!! Cannot say exactly but am heavily inspired by Indian motifs and Handicrafts!! Love to incorporate textures, layers and organic stuff like wood, twigs, dry flowers, jute/burlap, fabric etc in my creations! !I get fascinated by faces, leaves and birds and love to have these as focal points( one of the reasons I like Image/photo transfers)!! 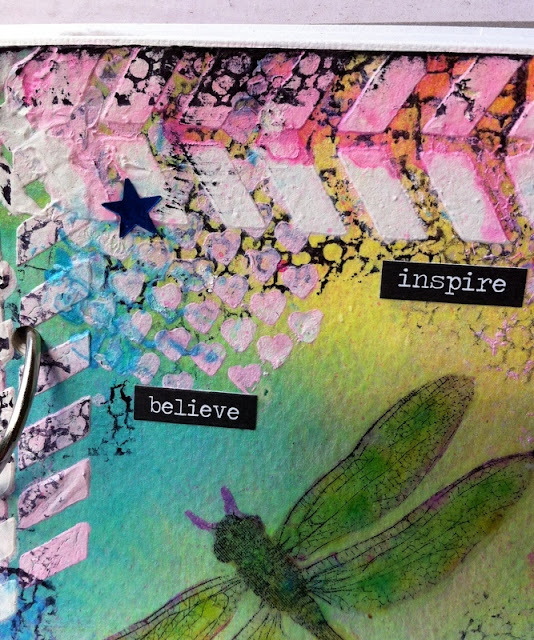 I love Mix media, Mandala designs…..Altered art and Recycling is always big on my list!! I have a long list of favorites and I like Andy skinner and Betty Krause’s works; I follow a lot of mixed media artists. Have plenty on my plate….home, kids, friends, reading, Facebook (haha…)and movies !! I am so happy to be here today and sharing something about myself with all of you. Thank you so much Karuna and team Lulupu for inviting me here !! I made myself a handmade Art Journal using thick Canson cardstock and Brustro Watercolor paper. Here is a tutorial on how the cover was prepared. I do hope this tutorial is helpful, I would be more than happy to answer your question, if any !! Print the image on copy paper using the laser printer and fussy cut it. Dilute the silks (ColourArte Silks acrylic Glazes in Sea Spray and Lemondrop)with some water and spray using mini misters to create the background. The silks are permanent once they dry. I hope you can see the shimmer. Once the background is dry, place the image face down and adhere with gel medium, give a coat of Gel medium on top as well and leave to dry completely. Once everything is dry,spritz with water and rub gently to remove the paper, be very gentle so that only the very top layer comes off. Let it dry and if you see bits of paper still sticking repeat the process. Coat the image with Gel medium to seal the image. I don't have the process pics after this , will try my best to explain. 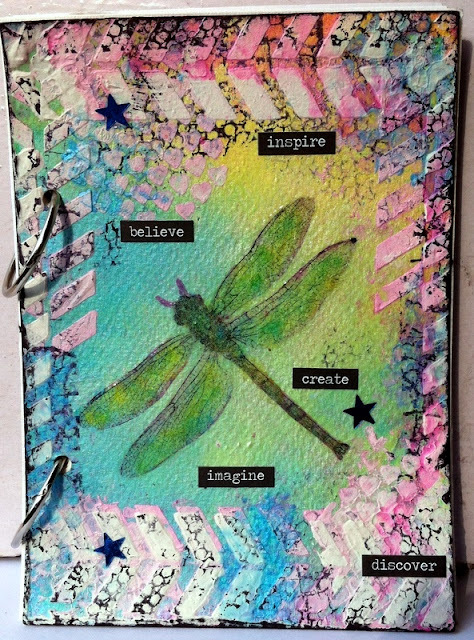 I have used the faber-Castell Mixed Media stencils, 101collection and texture paste to stencil all around, stamped with Black archival ink and Prima texture stamps, used ColourArte Silks acrylic Glaze in Apple Blossom to add some more color. Add the silks on the image to enhance the colors on it…the mica in the acrylic glazes adds so much of glamour to the image. Wow! What a gorgeous project. We also have a challenge running this month at Lulupu - Anything but square / rectangle. Link your entries and see the beautiful inspiration from our DT here. Tanvi here, with my inspiration the month. In both the cards I made, the focal point is the die cut & sentiment. To begin die cut the stitched rectangle (largest in the set - Simon Says Stamp) for the front panel of the card & then cut a circle on it. 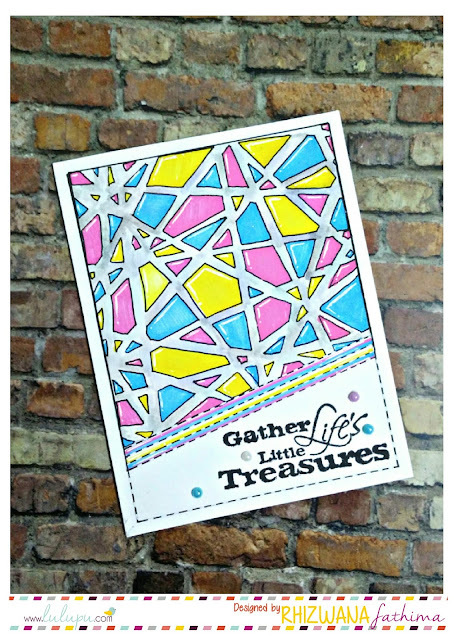 Now glue the pattern paper behind this (TIP - use a print with small patterns so that it shows in the small space behind the die cut). I saved the die cut circle for the next card! 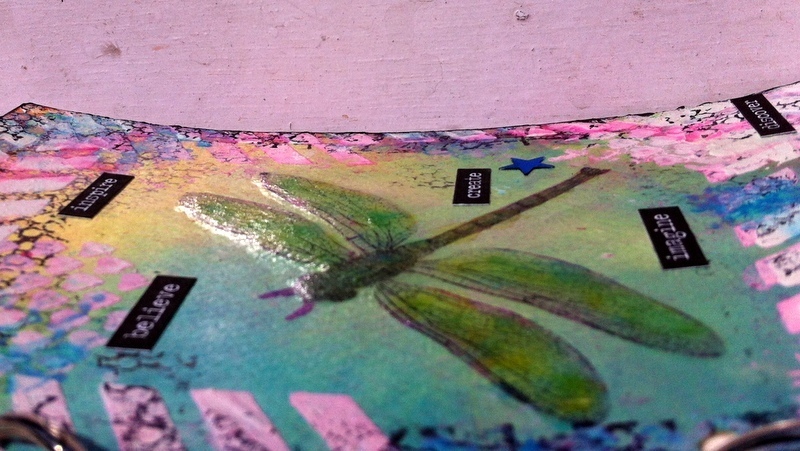 Using the next smaller die in the set cut another circle & stamp the sentiment on it. Glue it (foam tape) in the center of the pattern paper circle & finally glue this on the card base. In my second card I used the same circle dies to make a frame. So here we have two cards with the same dies! Thats it from me today! And remember you still have time to join this months challenge - Anything but square or rectangle. Its mid month and the design team have revealed their interpretations of this months challenge - Anything but square or rectangle. You can read more about the challenge here. Have you linked your creation yet? Through the rest of this month, the team has decided to showcase CAS cards. CAS stands for Clean and Simple. 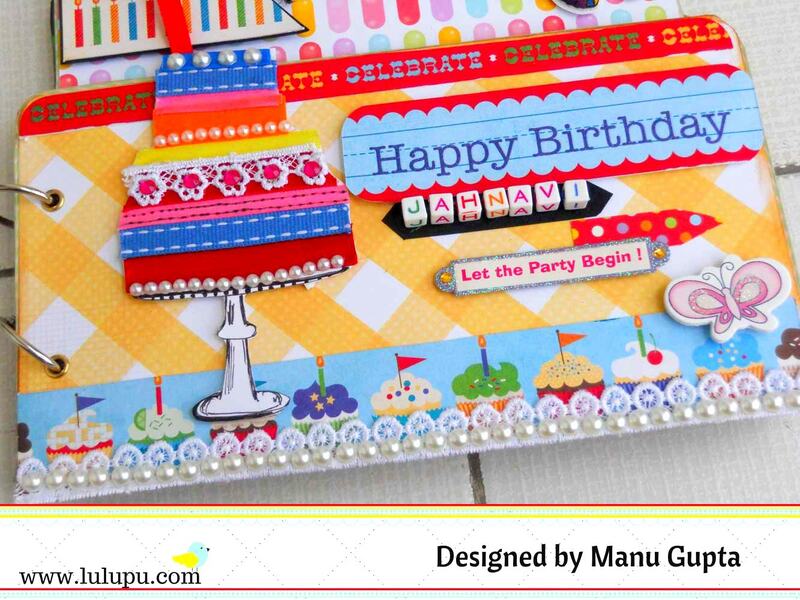 This means a card with lots of empty space, minimal layers or embellishments, in other words uncluttered. CAS is definitely out of my comfort zone, but once I started, found it hard to stop. Today, I'm sharing three cards from the lot I made, hopefully managed to find a balance between CAS design and my love for mixed media art. For all my cards, the background was created by using gesso + white sand texture through a stencil. 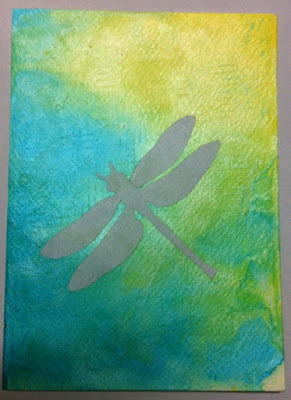 Gesso ensures that the texture paste gets a bright white color on drying to match the white card stock. On this one, as there is a contrast already between the texture paste and kraft card stock, no paints were needed, just some embellishments. On this card, the tiniest amount of watercolors were used through a waterbrush to infuse some color before embellishing with gold stars, title and vellum snowflakes. I usually make a few card bases together and experiment with different techniques and color combinations. One such piece of card stock was used to cut the three Christmas trees and another such piece was used to mat the card on.The words have been heat embossed with gold embossing powder after stamping with versamark watermark stamp pad. Don't forget to check back in a couple of days for more CAS card creations from the rest of the team. I also have a picture tutorial for making this one, so you might sit back, relax and read on! Here's what I made for my little one's First Birthday memories. Well, I love the way this one turned out to be and there are soo many elements that I love love love in this album and to my utter joy, my baby loved this one and gave me a huge grin when she took this album in her hands!! So worth the wait!!! Here's the step by step tutorial on how I made this album! Since I did not had any dimensions or any idea, I just make up my own dimensions and decided how big I wanted this album to be. The specifications I took are detailed below. 1. I first measured out the dimensions of each page (there are 4 pages) depending on how big and wide I wanted the album to be. Each page measures 5*9, 7*7, 9*9 and 11*9 resp. I did a rough paper draft first before I began to work on my chipboard album. You can also make it as per your measurements and required size! Once I was happy with my design on paper, I then used the same on a thick and sturdy cardboard and then cutted my design out. I taped some Washi tape onto the edges to get a neat look. Lulupu store has an amazing stock of Washi tapes and you can all grab them when the store opens back up! So here's my album before I starts embellishing it! 2. Once this was done, I did that one part we all love... choosing the right papers and embellishing it.Cut out the pattern papers a little smaller (less than 1mm) than the actual dimensions of each page. Here's how my album turned out to be. I loved making that cuke cake with ribbons and laces. and totally adore those square alphabet beads!! they make an awesome way to make names and like. This space is to keep up all those pics with the family members..
Ohhh yes, birthday's are fun with wishes.. so a little wish corner for my baby !!! I hope you all liked my shaped album and don't forget to participate in this months challenge. You can find all the rules and guidelines here.